Video projectors have come a long way. Today’s DLP and LCD projects provide home movie theaters with the kind of sharp viewing experience you only get at the real movie theater. However, being at home makes movie watching more comfortable. People even customize their experiences to create a better atmosphere. Color scheme selection is one of the most important parts of home theater design. The setup of a theater room actually can make or break how the projector delivers a good picture. Contrast plays another role as well. When selecting a color scheme, think of the colors used in professional movie theaters. Dark walls, black carpeted floors, dark red seats and low lights create the perfect atmosphere and movie watching experience. White rooms don’t allow for the kind of contrast necessary to get the best picture. These are just a few of the considerations to consider when planning a home theater. The best shades for most movie theaters range from dark grays, blacks and browns. These colors are neutrals and provide the best shades to contrast with for a home theater color scheme. Some color combinations that work include black with burgundy accents and dark grey with gold trim. Clients often want to set up a movie theater with a specific color only to realize that it doesn’t allow the projector to create the best movie watching experience. The most important part of creating a color scheme is choosing to have neutral and dark colors around the projection screen. Many home movie theaters also choose navy, garnet, myrtle or pine green, rust, plum and even violet. If you do choose to have more color in your theater, pick a neutral color scheme for the walls such as gray or black but pick a darker yet colorful paint for accents and trim. Any bright paint colors will likely reflect light and cause issues, so when picking a color, darker is better. Some possible color combinations include violet and dark gold, pine green and navy, navy and garnet or plum and tawny brown. Not only is color important, but the type of paint that you use in your home theater room is also something to consider. 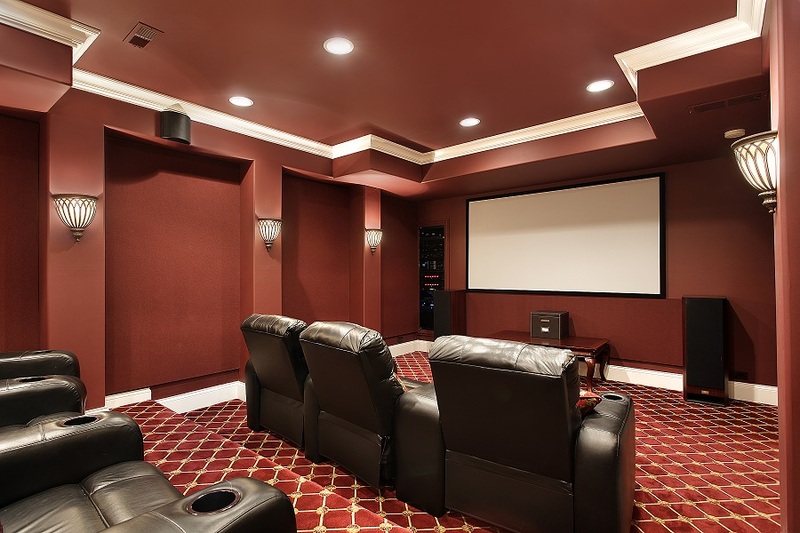 Since glossy or satin paint causes reflective light, you need to use a matte type of paint for the home theater room. Wallpaper also makes a great choice for home theater rooms as long as they are in dark colors and not glossy. If you have trouble deciding on how a type of paint or wallpaper will work with your projection room, just play a video on your phone and hold up to the wallpaper or paint sample in question. If you note a high amount of reflections, double the amount for a huge room with a projector to understand the problems associated with reflective walls. Lighting contributes drastically to the color scheme of a home theater room. Lighting, curtains and rugs liven up an otherwise drab color schemes necessary for the right ambiance in a movie watching atmosphere. Colored lighting such as amber or topaz provides beautiful contrasts to most color schemes. In addition, patterned rugs, dark carpeting and plush seating add another factor into color schemes. Traditionally, most theater seating is black or burgundy, but you can also experiment with navy and pine green. When choosing color schemes for a home theater, remember that darker colors reduce reflection from the projector and screen. It’s easy to liven up neutral color schemes with lighting, curtains, colored chairs, rugs and carpet. Color schemes can include some light choices but always remember to use matte paint. Steve designs and installs custom home theaters in Houston, TX. During his free time he enjoys writing about the various factors that contribute in creating a perfect home theater.